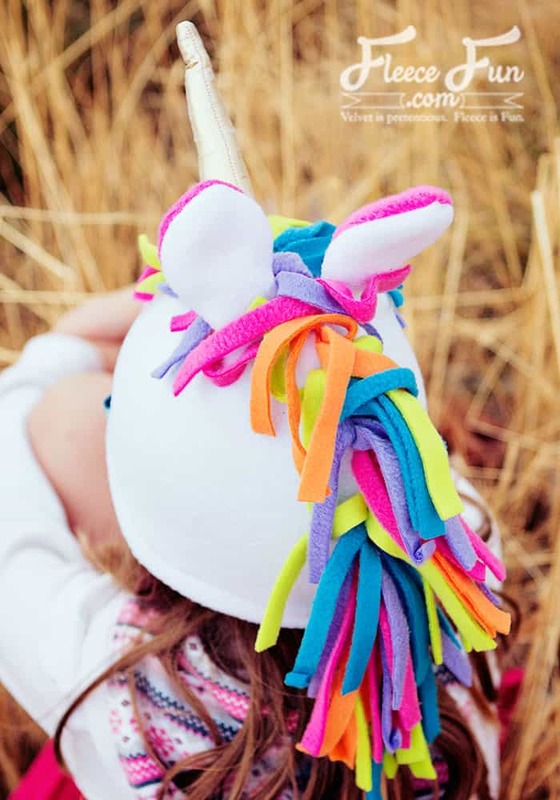 This Fleece Unicorn Hat Pattern DIY has a free pdf template! 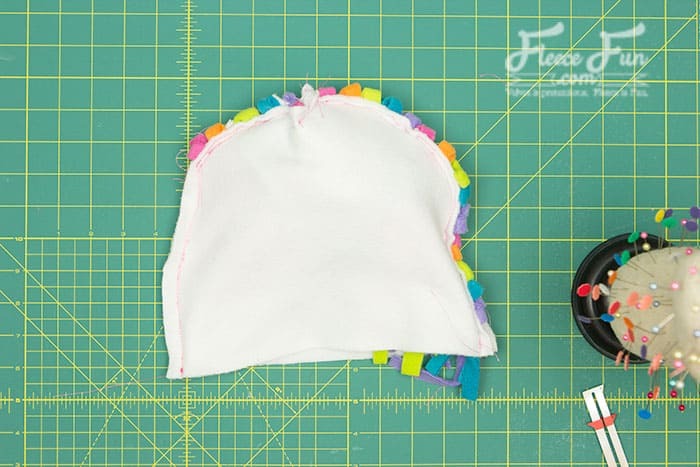 This step by step tutorial uses the Basic Fleece hat pattern and modifies it to add magical unicorn elements. These elements are a horn, ears and rainbow mane. 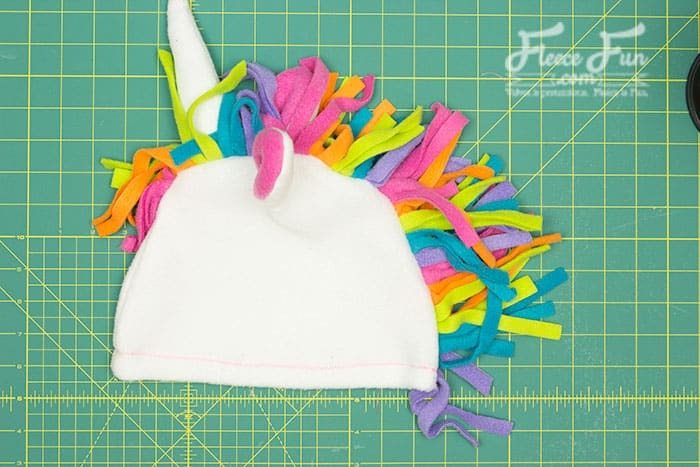 A word of advice you will want a strong machine as you will be sewing through a lot of layers of fleece to make this fleece unicorn hat. 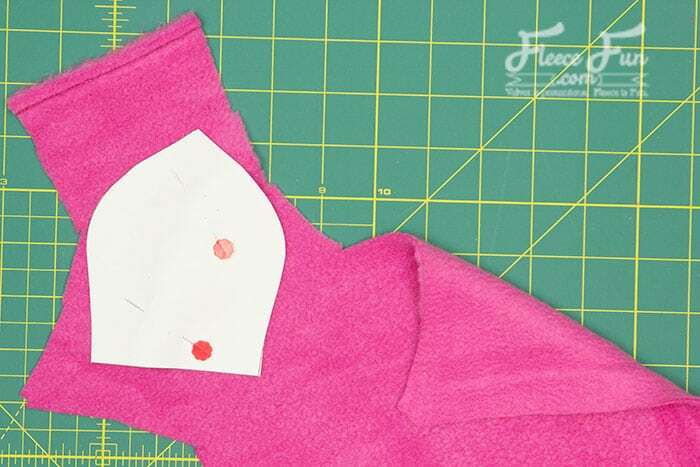 On folded cloth pin pattern and cut out. 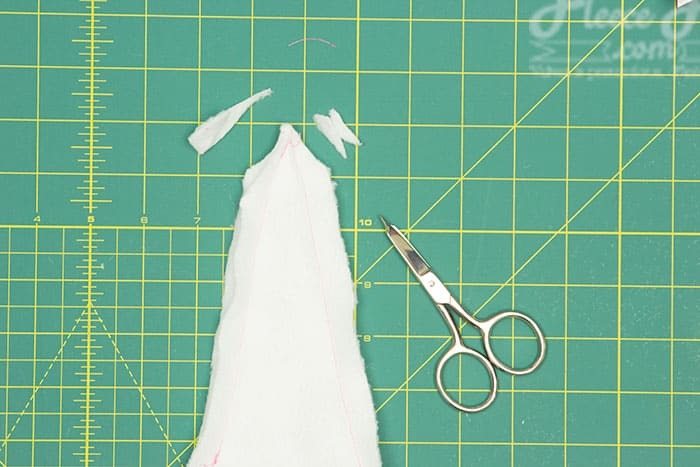 So you have two of the pattern pieces cut out. Set the base of the fleece unicorn hat pattern aside. For the ears cut out 2 pieces from white fleece. 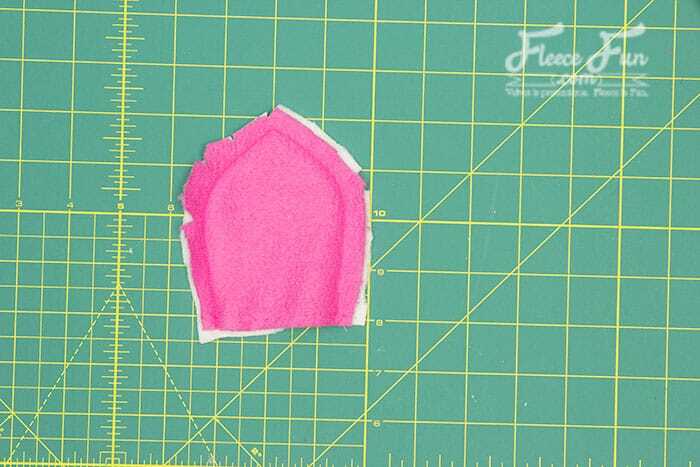 Cut out 2 from pink fleece ( or any color desired). 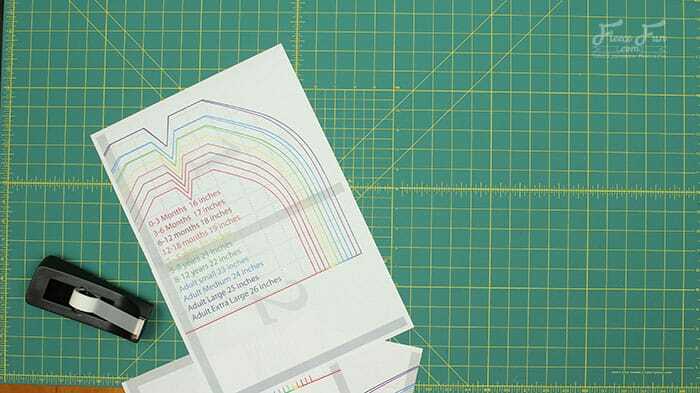 Once turned fold the edges in to the center and tack down with a basting stitch. 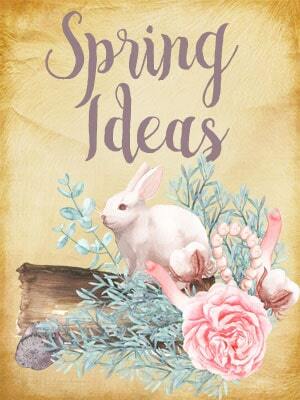 Set the ears aside. It’s up to you if you want to make the horn gold or not. In the example I started with a white one, and in the end I took it out and put in a gold one because I felt it “popped” more on the hat. 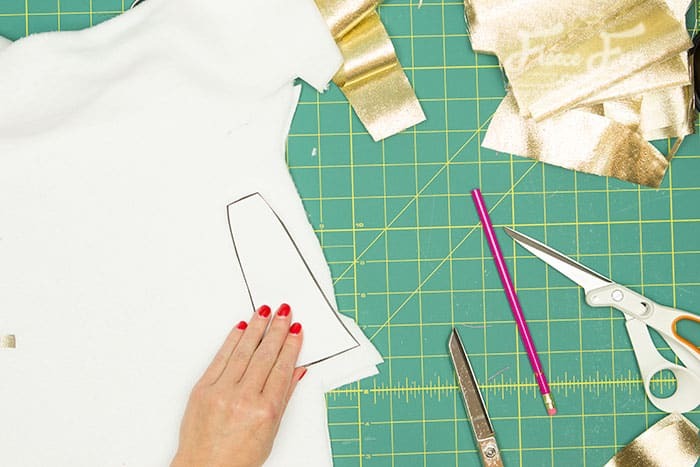 It’s up to you how you want to do it as the sewist. Cut out two of the horn from white fleece. 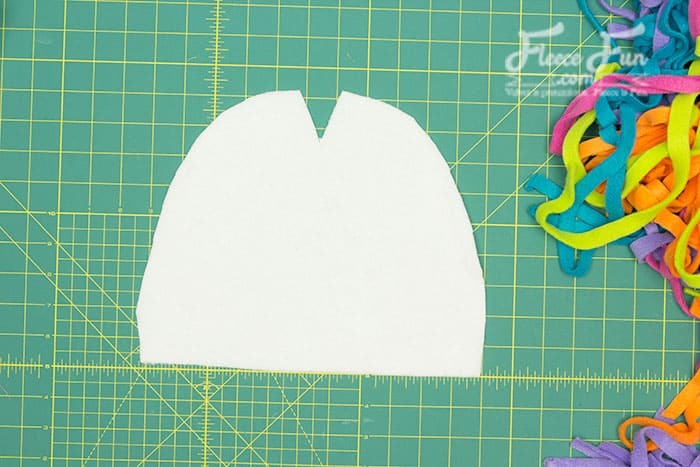 If you want to make a gold horn cut out two additional unicorn horn shapes from the gold lame’. 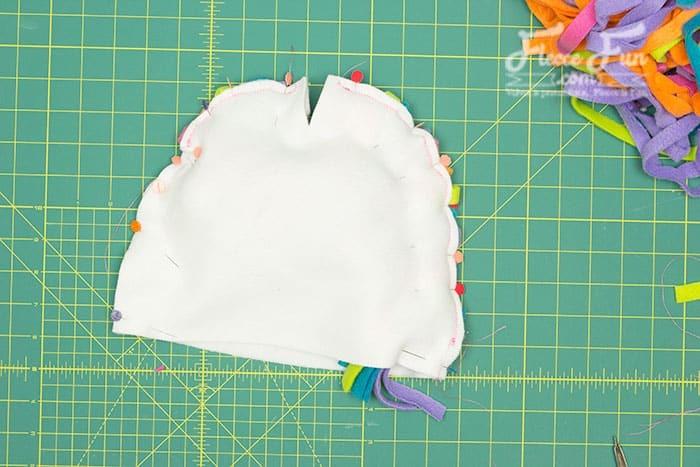 If making the gold unicorn horn sandwich the two gold pieces in between the right sides of the white fleece and sew if all together using a .5 inch seam allowance., leaving the bottom open for turing. If making a plain white horn do the same, just no gold lame’ sandwiched in between. 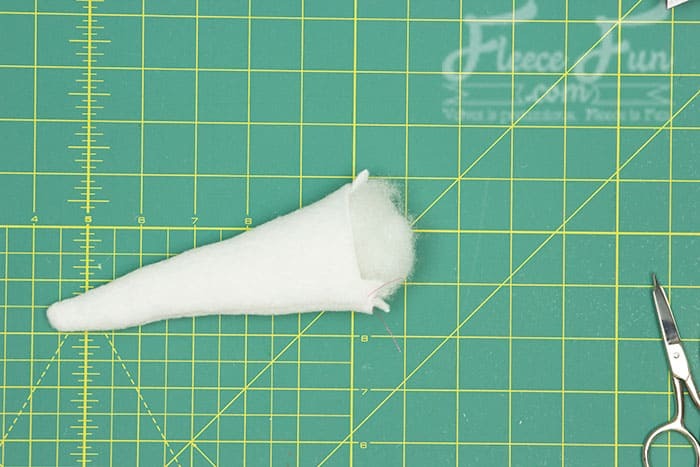 Trim down the bulk at the top of unicorn horn to make a nice point, but leave the rest of the bulk on the sides to help the horn stay erect (no one likes a saggy unicorn horn, that’s just sad). Turn horn right side out and stuff firmly with batting, making sure that about .5 of the bottom about a finger’s width) and be squeezed together to go into the seam allowance. 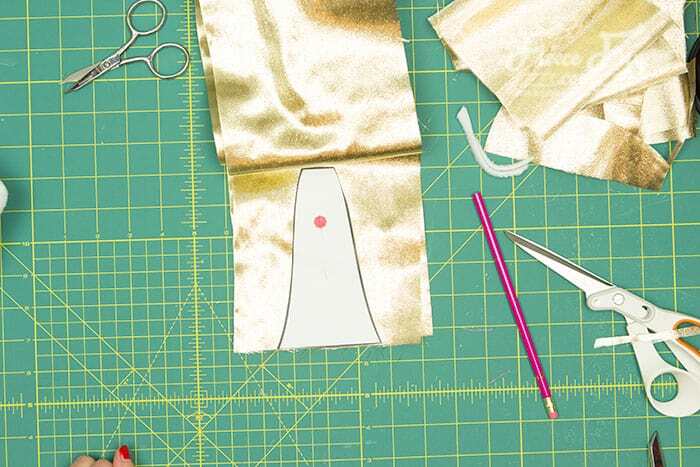 Note when turning the unicorn horn with the gold Lame’ take care and take your time or the fabric can tear an/or run. Set the unicorn horn aside. 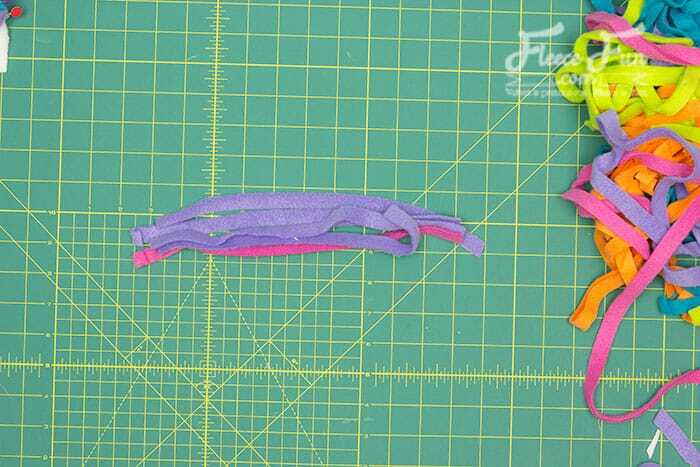 Cut long .5 inch strips from the fleece colors that you wan to make up the mane on your fleece unicorn hat. 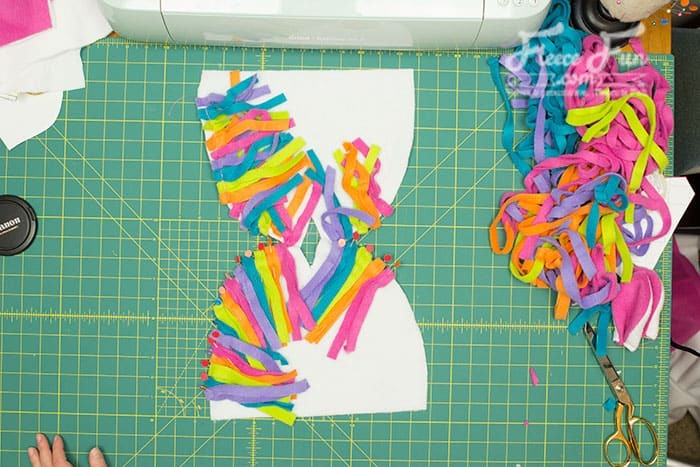 Then cut down your strips so they are 11 inches long I had 5 colors and had 8 strips of each color – but you can add or subtract to suit how you want it to look. 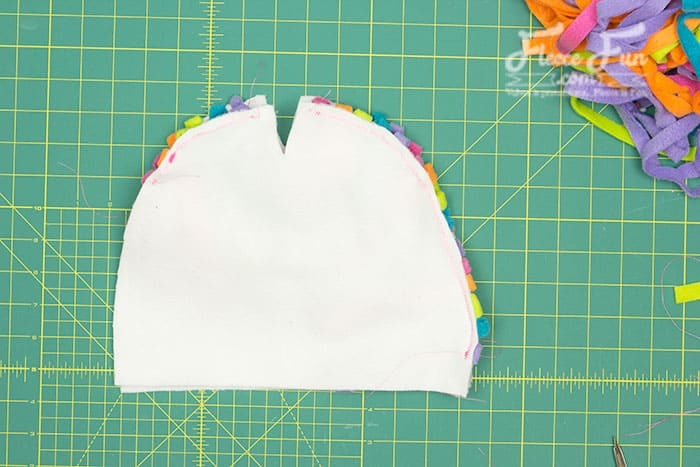 Take one side of the base of the unicorn fleece hat pattern that you cut out and lay it so the right side is facing up at you. 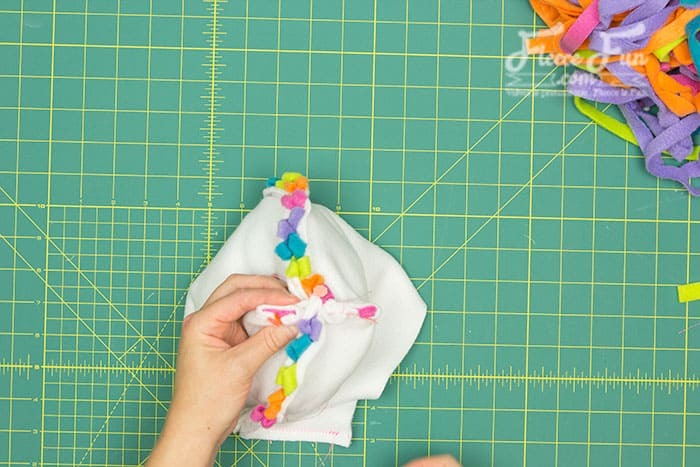 Fold the strand in half and pin it into place. Lay each stand nect to the other starting about a third of the way up on the side that will be the front of the hat. Continue to alternate colors and pin, having the mane go all the way down the back, leaving between 1.5 and 2 inches at the bottom for the brim. 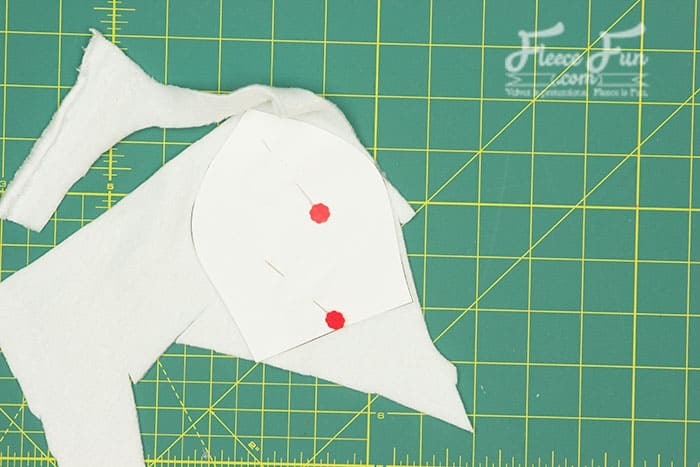 Next pin the other side as a mirror image of it so when you sew the two halves together the mane lines up. 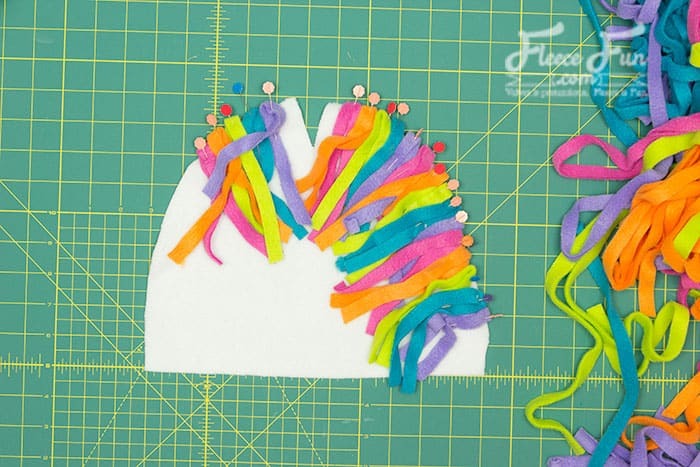 Base down the mane strands to the hat using a zig zag stitch and a .25 seam allowance (trust me, we’re dealing with a lot of bulk and the basting will help). 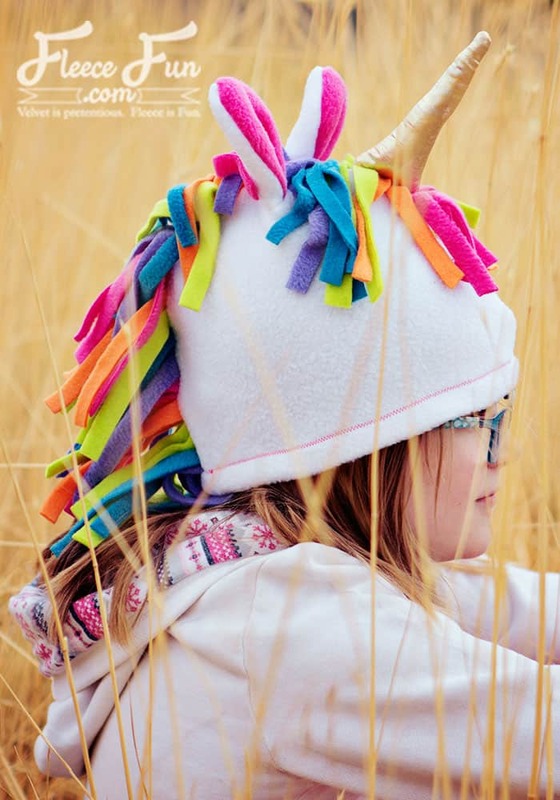 Decide on the placement of the unicorn horn and baste it down to one side of the hat, using the same method as you did for the mane. 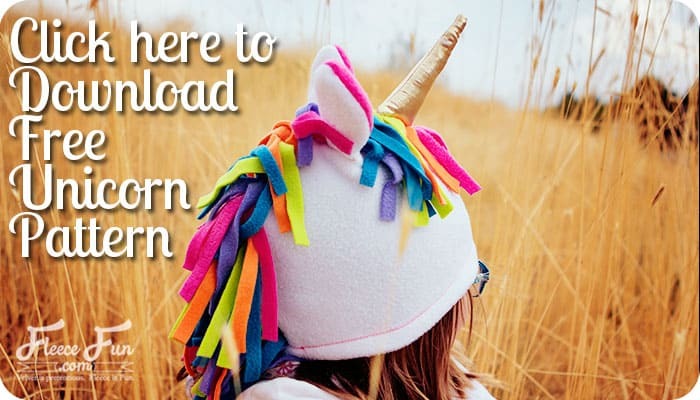 Note: The unicorn horn in pointed into the hat for sewing. 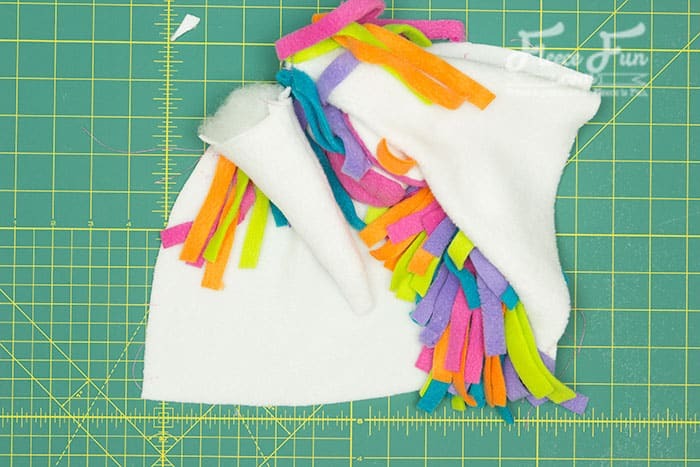 Lay the second half of the hat on top of the first, mind the mane isn’t caught up in the seam allowance and that the mane matches up so the side that is longer is together. 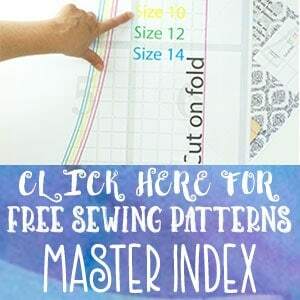 Pin through all those thick layers (this will help with sewing). 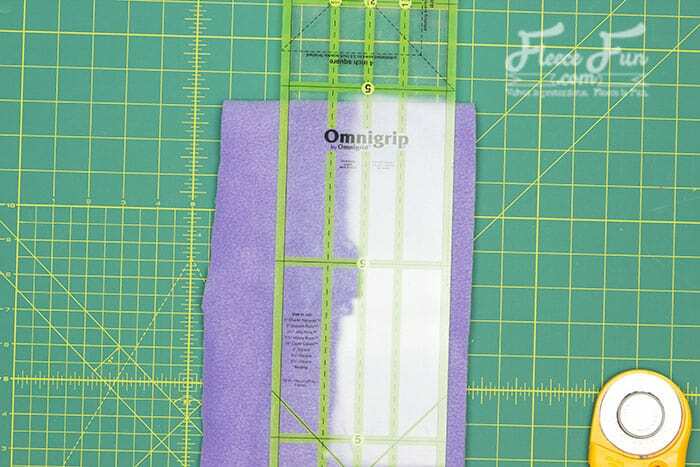 Sew the front and the back using a .5 inch seam allowance. 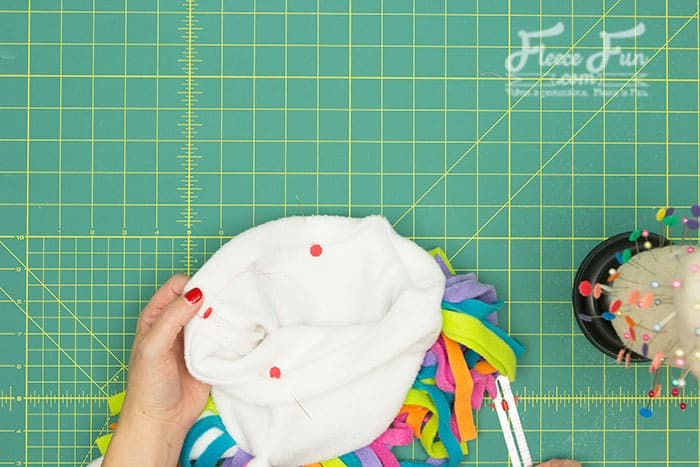 Take your time and go slow, you might need to loosen the tension on the thread to get through all the layers of fleece – especially around the horn area. Notice how there’s that section that looks like a v in the middle that we didn’t sew? That’s where the ears go! The side of the ear that is folded and shows pink needs to face forward – toward the horn. 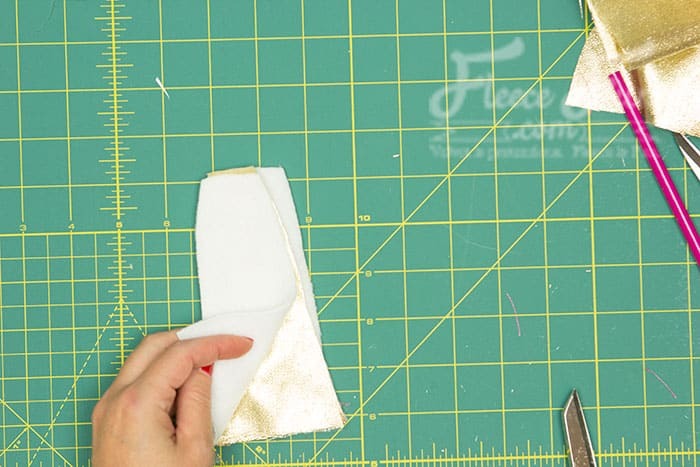 Pull the “v” on either side so the seam in the middle ( the one you just sewed) touches in the middle (think boxed corner). 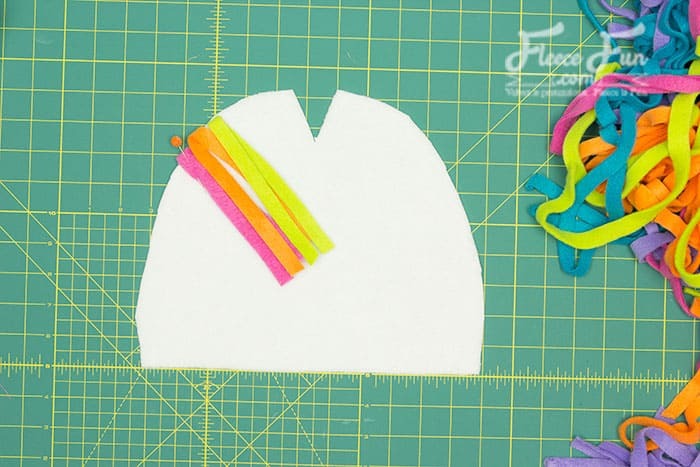 Pin the ears on either side, with the oink facing front and the ears pointed down into the hat, sandwiched in. 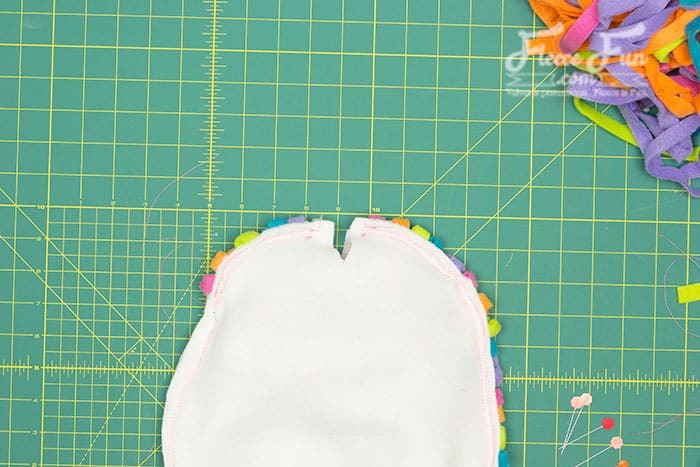 Sew across that top seam with a .5 inch seam allowance to complete the top of the fleece unicorn hat pattern. 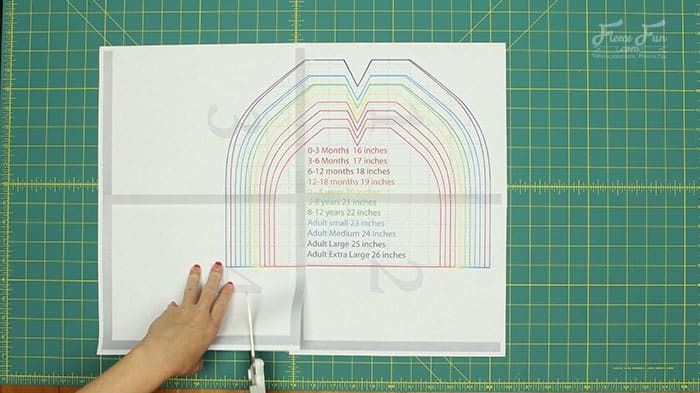 Turn the brim under (so wrong sides together) .75 to 1 inch and sew down using a zig zag stitch long the edge. 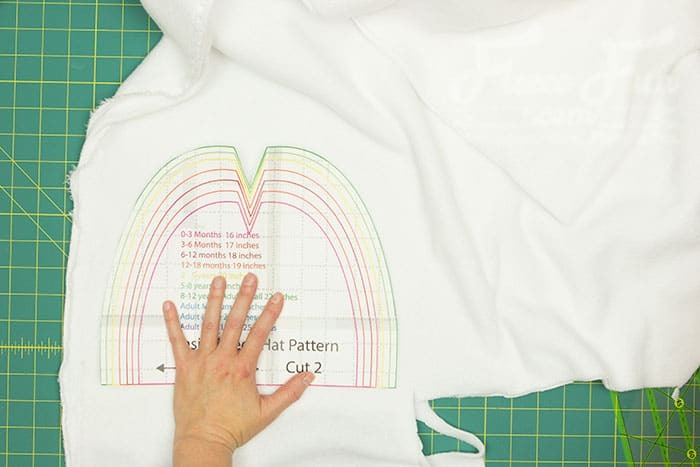 Trim your threads and you’re finished with the fleece Unicorn hat pattern.